New York, New York, U.S.A.: Artisan, 1996. Stated First Printing. Text/BRAND NEW. Embossed dark blue linen boards/Fine. DJ/NF. Guide and suggestions for decorating offices. Especially pertinent with the rise of serious, dedicated home offices. Pointers and reminders for making the workplace beyond function to be pleasant as well. 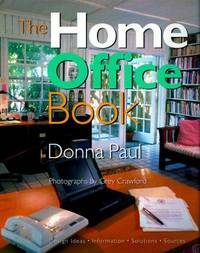 Text, supported by some 300 color photos, is a fine resource for planning offices for business or home.. First Edition, First Printing. Hard Cover. New/Near Fine. Illus. by Grey Crawford (Photographer). Highland Oark, NJ: Dragon Cloud Books; As Is/So & So Books, 1987. Text/BRAND NEW. Illustrated soft cover (White and Black, Martha Alf, 1974)/NF w/light rubs to leading edges. Anthology/collection/grouping/gathering of oems/sounds/music/thoughts/designs. Marron writes: "The maps & menus you find here are old & new/They range out from mountain haiku/mined ancient notebook nuggets/& hardy marginalia." And so, there is "snArl" that roars and stands compact and tight; tender green "alfalfalfalfalfalfalfa" fields stretching endlessly; and, "jack daniels & wang wei/reading early kerouac" that toasts and elevates greats of East and West while using lower caps for total reduction. 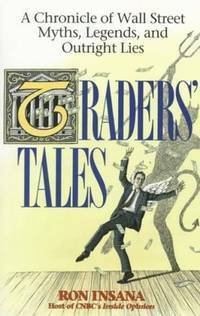 A small rich volume.. First Thus. Soft Cover. Near Fine/None As Issued. New York, NY: Council for Social Action, 1949. Text/Near New. Illustrated soft cover/VG with closed tears to upper/lower spine edges. Monthly periodical published by the Council for Social Action of the Congregational Christian Churches and by the Commission on Christian Social Action of the Evangelical and Reformed Church. An analysis of the contemporary social/political scene in 1949 China at the onset of Communist take over. The 6 essays are: China, Communism and Christianity (Kenneth Underwood); Christian Interest and the Communist State in China (M. Searle Bates); Chinese Communist Ideology and the Christian Faith (Charles C. West); The Christian Response to Revolutionary Change in China (Rowland M. Cross); Washington Report (Thomas B. Keehn); and, On To Action (Ray Gibbons).. Paperback/Stapled. Very Good/None As Issued. New York, NY: Simon & Schuster, 1983. Text/BRAND NEW. Illustrated bi-color boards/Fine. DJ/NF; light edge wear w/short closed tears. Some 250 recipes & special menus from Pear Byrd Foster whose acclaimed restaurant, Mr. & Mrs. Foster's Place, is in New York City. The recipes are distinctly American with an innovative flair. Fine copy.. First Edition, First Printing. Hard Cover. Near Fine/Near Fine. Illus. by Susan Gaber (Illustrator). Des Moines, IA: Meredith Corp, 1977. Text/BRAND NEW. Illustrated boards/NF w/trace rubs to corner tips. Beef cookery from formal sit-down fare to outdoor barbecues. Tested recipes augmented with color photos. Text in 4 sectors: 1, Roasts to Remember; 2, Steaks for All Occasions; 3, Always-Popular Ground Beef; and 4, More-for-Your-Money Beef. Fine copy.. First Edition, 3rd Printing. Hard Cover. Near Fine/None As Issued. New York, NY: Holt, Rinehart & Winston, 1970. FRENCH LANGUAGE TEXT. Text/BRAND NEW. Illustrated soft cover/NF w/light wear to leading edges. 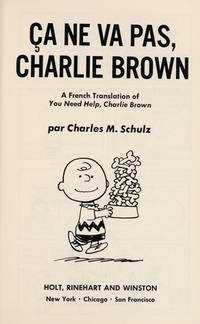 French translation of You Need Help, Charlie Brown.. Reprint. Paperback/Stapled. Near Fine/None As Issued. Illus. by Charles M. Schulz (Author-Illustrator). 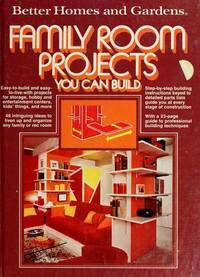 New York, NY: Holt, Rinehart & Winston, 1972. FRENCH LANGUAGE TEXT. Text/BRAND NEW. Illustrated soft cover/VG; Strong & sound w/light rubs to surfaces & leading edges, and small loss to upper front edge by spine. PO name on front cover verso. French translation of You're Something Else, Charlie Brown. Strong copy.. First Thus. Paperback/Stapled. Very Good/None As Issued. Illus. by Charles M. Schulz (Author-Illustrator).